The Vortex 10 Map ECU for KTM is like our 10 Map Ignition and EFI Interceptor rolled into one module controlling not only ignition timing and voltage output but also fuel mapping and other engine management functions. The result is more power, better power, easier starting and ultimately faster lap times. 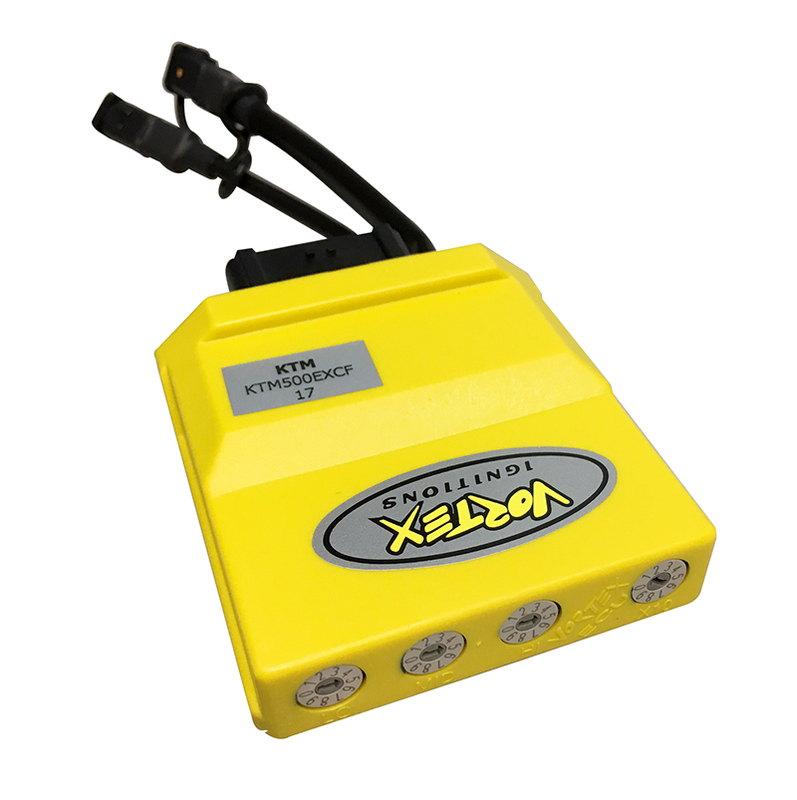 This Vortex ECU unit comes pre-programmed with 10 Performance Fuel & Ignition maps as well as having 3 additional switches for user trimming of fuel in lo, mid and hi throttle openings. 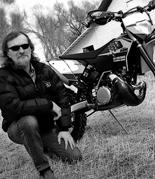 The Vortex 10 Map ECU for KTM plugs directly into the bikes standard wiring harness and interfaces with all the standard engine sensors such as ECT (Engine Coolant Temperature), IAT (Intake Air Temperature), MAP (Manifold Absolute Pressure), TPS (Throttle Position Sensor), CPS (Crank Position Sensor) to adjust fuel and spark timing for optimum power delivery in all weather, altitude and load conditions. Performance gains vary depending on throttle and RPM points however typically gains are in top-end power and bottom-end throttle response/torque is expected from the “Power” settings and a smoother more tractable or rideable power from the “Traction” settings. We have done extensive work to include tune parameters which improve starting and almost eliminate the flame-outs experienced with some EFI bikes. All the development work is done for you with the Slavens Vortex ECU Maps for KTM! 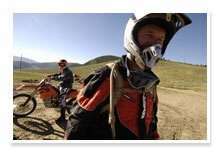 All that is left is for you to do is choose a setting that best suits your riding style or track conditions and ride! 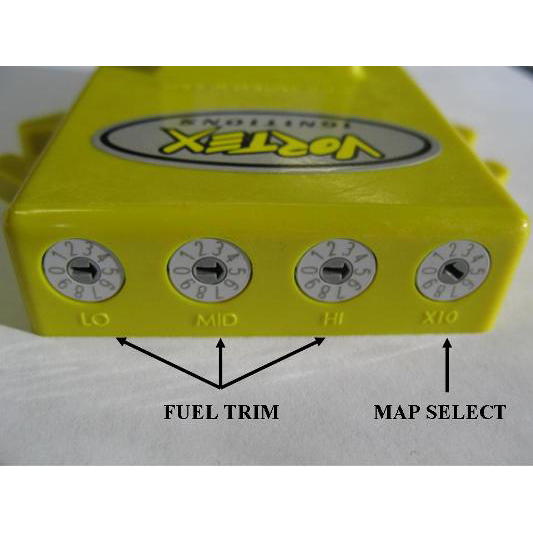 Pre-programmed with 10 performance fuel & ignition maps – all the work is done for you! Call Jeff Slavens & the team today at 719-475-2624 for any questions or additional information that you would like on the Vortex ECU Maps. “After watching your video on Vortex I bit the bullet and ordered one. Installed two days ago and have ridden it twice, once in power mode 1 and then in power mode 5. OMG! If you want your 2017 to rip as it should, and I realize rip is subjective on a 350, you need this Vortex. Faster, stronger and better than any other mod out there. Great to see a product work as good or better than advertised from a dealer who truly knows his stuff! P. S. I never put any ones stickers on my bikes, but in this case, Slavens and Vortex are proudly displayed!